Order any of our products... whatever combination and we will create a gift wrapped box for the recipient. Just add $4.99 to your order to make it a beautiful gift they will always remember. You can even have a personalized message sent with your order. Contact us with any questions you may have so no matter what kind of gift you are looking for from a romantic gifts, wedding gift, bachelorette gift, anniversary gift or even for a friendaversary... we have you covered. Please Note: You may request a desired color wrap and bow in the Special Order Instructions section during checkout. 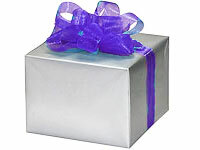 Otherwise, we will wrap it in purple paper with a purple ribbon. Tissue Wrap Made in the USA from 75% Post Industrial Recycled Fibers. #1 Grade MF tissue paper. Gift Boxes Made with 100% post-cosumer recycled materials and Green seal certified. Gift Basket Shreds Made in the USA from 75% Post Industrial Recycled Fibers. #1 Grade MF tissue paper.